"Excellent detective story with great main characters!" 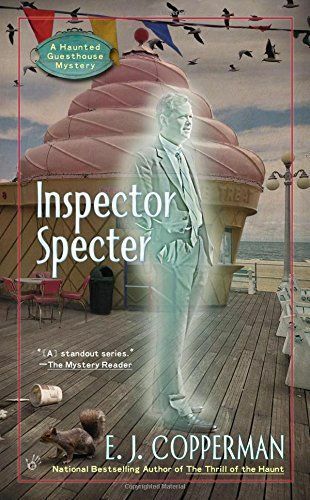 INSPECTOR SPECTER is Book six in the cozy mystery series by E.J. Copperman. Although INSPECTOR SPECTER is part of a series, I feel that a reader who may be new to the series will still be able to enjoy this story. E.J. Copperman does a good job of giving background information on the main characters to help establish who they are and what their relationships to each other are. With ghosts, gangsters, a missing detective, and a baby thrown into the mix, INSPECTOR SPECTER is a book that really keeps you guessing. As with the previous book in this series, Alison has a few mysteries to solve. In addition to a policeman's death under unusual circumstances, she also has her client's disappearance to contend with. I love the dual mysteries and find them both to be completely engrossing. The shady characters scattered throughout INSPECTOR SCPECTER are reminiscent of the type found in a Raymond Chandler novel. I worried, at first, that the baby in the story would be a problem but it didn't have a negative impact on the detective work. Once again, E.J. Copperman's style of story- telling makes me feel as though I'm in the thick of things hunting down leads along with the main characters. The main characters in this Haunted Guesthouse series -- Alison and her human and ghostly mixed family -- are so likable and are a big part of what keeps me coming back for each new book. Alison's boyfriend Josh is a nice addition to the series and I like that there is no romantic drama to distract from the mystery. The little subplot involving ghost and fellow detective team member Maxie is an interesting side story. I love that the ghosts, including Alison's father, not only help Alison on cases but are her friends as well. INSPECTOR SPECTER is an engaging detective story that keeps you guessing. The varied ghost population makes for some great main and secondary characters. I love this mystery and can't wait for the next installment! Detective Lieutenant Anita McElone is one of Harbor Haven�s finest. She�s also a hard-boiled ghost skeptic. So when she shows up on the doorstep of Alison Kerby�s Haunted Guesthouse to ask for supernatural help in solving the murder of her former partner, it�s hard to tell which woman is more flabbergasted. But McElone is dead serious, so Alison promises to help in any way she can�even asking her resident ghosts, Paul and Maxie, for help with the case. As Paul�s spirit source reveals some troubling information about the deceased detective, Alison wrestles with what to tell McElone. First, though, she has to find her�because the lieutenant has suddenly disappeared. Normally, I wouldn�t have bothered to check the phone immediately, at least not before I�d finished the task at hand and showered�and very likely changed my clothes, ordered dinner and straightened up a couple of rooms�but my daughter, Melissa, was at her friend Wendy�s house this afternoon and might have been texting to let me know she needed a ride home or (more likely) to ask if she could spend the night there. Such are the thrills of summer vacation. You�re only eleven once. I wiped my hands off the best I could, then let the rag fall onto the drop cloth I�d carefully placed under the work area. I am nothing if not prepared. But the text I�d received was not from Melissa; it was from Detective Lieutenant Anita McElone of the Harbor Haven Police Department. My breath stopped for a second. When your eleven-year-old isn�t at home, you really don�t want to get a call from the police. I knew McElone a little, but we weren�t what I�d call �friends,� and she�d never contacted me out of the blue before. That took some of my panic away but piqued my curiosity. I looked out the window of the home theater�therein lies a tale; it was slated to become a fitness center for the guests until I found out how much exercise equipment costs�and sure enough, McElone was standing on the front porch next to the glider, hands clasped behind her, pacing. I sighed. The big scaredy cat. Lieutenant McElone, one of the most unflappable people I have ever met, is afraid to come into my house because she thinks she�ll see a ghost. Which is silly. McElone can�t see the ghosts who stay in my house. Melissa and I moved to Harbor Haven, the town where I grew up, about three years ago after a divorce from a man I call �The Swine,� although that sometimes makes me feel like I�m insulting actual pigs. I bought the property at 123 Seafront because I wanted to start a new life for us here on the Jersey Shore, and I�d been in the process of renovating the place when things changed after a freak . . . we�ll call it an �accident� . . . left me with a severely bruised head, a concussion, and the ability to see ghosts. Specifically, Paul Harrison and Maxie Malone, who had been inhabiting the old Victorian since they�d been murdered on the premises. Once they realized that I could see them, they�d wanted me to find out who had killed them. But that�s a story told elsewhere. As it turned out, I was not the only member of my family who could see Paul and Maxie, though I was the only one who�d had to sustain a head injury first. My mother and Melissa were both professional-level ghost communicators and had been keeping that little fact from me for, let�s say all my life in Mom�s case and all her life in Melissa�s. But I have forgiven them. I am magnanimous. And it comes in handy now that my father has passed away. I�m sad he�s dead, but he�s still around a lot. My family is an emotional roller coaster. Probably in a different way than yours. I took a breath before heading outside to McElone. I�d specifically chosen this moment to work on the theater because I was, for once, alone in my thoughts, something that almost never happens around the guesthouse. With Liss at her friend Wendy�s and all six of my current guests out at the beach on this scorching hot day, the only �company� I�d normally have had would be the ghosts. But Maxie, who�d recently developed the ability to leave the property, had decided to go visit her mother, and Paul, who still can�t wander farther than my property line, had been . . . not upset, and not exactly broody lately, had been showing signs of some ennui, which he had not explained. I decided he was a grown man�if a dead one, which would understandably bum anyone out�and I�d let him work out his issues until he brought them up himself. Wiping off my hands again, I walked out of the theater, down the corridor to the entrance, and opened the door. A blast of heat and humidity, which you tend to forget about when you�re living in air-conditioning, smacked me hard in the face. �I�m not afraid,� she protested. �I�m just not interested in seeing any more than I already have.� The lieutenant has been witness to a few of the less conventional events that take place in my house. Events that several of my guests pay good money to witness, but the novelty of it is lost on McElone. There was a tentative quality to her that I�d never seen before. McElone doesn�t actually have a sense of humor, but she�s usually sharper in conversation than this. It probably would have been bothering her more if she�d known that despite my assurances about the lack of ghosts, Paul had just risen up from the crawl space under the front porch and was watching her closely. �You didn�t call the lieutenant, did you?� he asked, knowing full well that I wouldn�t answer him directly with her there. �What brings you here, Lieutenant?� I asked for both our sakes. �Have there been complaints about the guesthouse again?� Locals in Harbor Haven know the stories about the place, and I had recently installed a prominent sign, just to the left of the front door, that read proudly, �Haunted Guesthouse,� replacing a temporary one Melissa had made on poster board. But occasionally, the odd�and some of them are very odd�tourist or a townsperson with an especially prickly nature makes a complaint at the police station about �weird goings-on� or �strange noises� emanating from the house. None of which is actually true, since the ghosts can�t be heard at all if you don�t have the ear for it. �Do you remember Martin Ferry?� McElone asked, out nowhere. McElone nodded. Then she shuddered a little, bit her lip and looked like she was fighting tears. �He�s dead,� she said finally, forcing the words out. �Oh, Lieutenant,� I said. I�ve never called McElone by her name, only her rank. We don�t have that kind of relationship. �I�m so sorry to hear it. Was it sudden?� I recalled Ferry as a middle-aged man with a prodigious belly; I wondered if his heart had given out.